2016 Racing Miku Design Submissions Now Open, Start Drawing! The Goodsmile Racing x Piapro collaboration for 2016 Racing Miku design has begun! 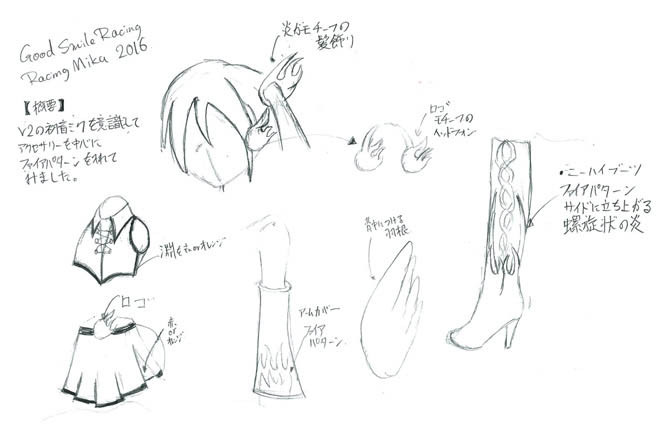 This will be the first time we’ll witness a completely fan-based Racing Miku design in the battlefield. The collaboration came as a sudden announcement recently via live stream on July 20th. The concepts are “Blaze”, “Victory”, and “Phoenix” (She sounds ready for another race in Thailand). Participants are free to illustrate their ideas however they please. Rather than focus on colors and lines, your ideas will be heavily recognized. Each submission requires specific tags, and we have prepared a detailed procedure below. Anyone can enter, and you’re not required to be from Japan. Create your design, and save in JPG format. Keep image size BELOW A4 size, and use 150dpi resolution. Before submitting the design, click on the Edit Tags button 「編集」. Click 「ロックする」 to lock the tag. Confirm that the Lock Icon is on the left-hand side of your tag (this is the most important part of the process), then submit. Once your submission is successfully completed, it can be found listed with the other submissions on the official site. The submission deadline is on July 21st at 9:00 JST. Once the winning design has been selected, she will be announced via live stream on Hatsune Miku GT Project channel on nicovideo on July 22nd. The winner will be rewarded with a pair of tickets to his/her chosen race in Super GT 2016. For details on the previous Racing Mikus, you can visit the History of Racing Miku section on Goodsmile Racing site for illustrators, designers, and a complete package of all official illustrations.